Forklift scales instantly speed up pallet weighing processes - a common goal in any industry as companies strive for improved productivity and revenue recovery. Designed for challenging industrial environments, METTLER TOLEDO’s forklift scales strive to maintain the highest level of accuracy in an atmosphere that is complex and busy. By allowing employees to weigh while on the move, forklift scales dramatically increase loading and transporting efficiencies. As the name suggests, forklift scales have a scale built into the forklift, allowing the scale to weigh cargo using sensors in the hydraulic system. This provides a great advantage to workers who transport materials and need to know how much of a product is being loaded. Forklift scales also benefit the bottom line - reducing the costs of cargo loading and shipment. 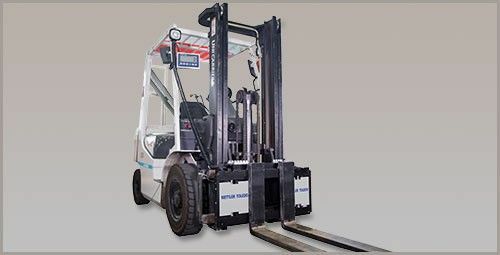 Forklifts, which in general weigh 1.5 to 2 times the lifting capacity of the forklift, provide a useful tool in transporting large shipments of product. Having an accurate scale to measure that product is important for reliability and accuracy, which is why industries should only rely on precise forklift scales. Regardless of environmental disturbances, METTLER TOLEDO forklift scales retain calibration for 12 months. The unique three-point scale suspension ensures that results are accurate, repeatable and legal-for-trade, reducing the expense and hassle involved in frequent re-calibration. Designed for safety and uptime, our forklift scales can withstand an overload of 150 percent, and have undergone extensive testing to prove their mechanic safety and durability. A high-visibility window and a compact terminal also makes it easy for the forklift scale operator to see loads, position forks for lifting and avoid accidents. If you’re worried about the time it takes to install a forklift scale, rest easy. In less than 30 minutes, installation is completed, without affecting its warranty. The robust design also provides an easy maintenance schedule, reducing the need for service. When needed, however, service is made easy by the ability to slide the scale off the bracket. Save time with forklift scales by reducing the need to travel back and forth to a fixed scale, as well as reduce the wear and tear on your equipment from increased travel. Accurately weigh pallets in tough, industrial environments. Rugged design and a patented three-point suspension combine to ensure accurate weighing results in the toughest, roughest conditions, without the expense or hassle of frequent recalibration. See for yourself. Watch the VFS120 in action. METTLER TOLEDO Forklift scales is a cost effective solution to speeding up your pallet weighing processes by weighing as you drive for improved productivity and revenue recovery. Designed for tough industrial environments, our forklift scales set the standard for reliability, safety and accuracy in heavy-use applications, with local and International Weights and Measures Approvals that guarantee weighing quality. Regardless of environmental disturbances, METTLER TOLEDO forklift scales retains calibration for 12 months. The unique 3 point scale suspension ensures that results are accurate, repeatable and legal-for-trade, reducing the expense and hassle involved in frequent re-calibration. Designed for tough industrial use, our forklift scales can withstand an overload of 150% and has undergone extensive testing to prove its mechanic safety and durability. A high-visability window and a compact terminal makes it easy for the forklift operator to see loads, position forks for lifting and avoid accidents. Easy installation with a hang-on scale has your forklift ready to weigh in under 30 minutes, without affecting its warranty. The robust design minimizes the need for service and where needed, service is made easy by the ability to slide the scale off the bracket.